The microbial source hydrocolloids market report illustrates data for 2018 (estimated) to 2026 (the forecast year), in terms of both, volume in MT and sales revenue in US$. The report comprises various forecast factors that impact the growth of the microbial source hydrocolloids market. 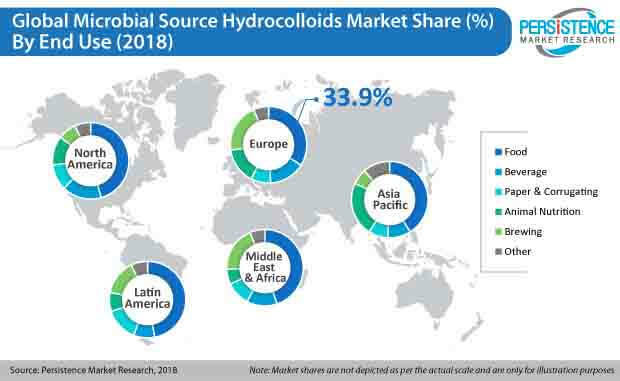 Market dynamics such as opportunities, drivers, trends, and restraints have also been included in the microbial source hydrocolloids market report. The drivers impacting the microbial source hydrocolloids market include the associated health benefits related to microbial source hydrocolloids, expansion of the ready meal and convenience food market catalyzing the demand for microbial source hydrocolloids, and microbial source hydrocolloids replacing and reducing other ingredients in food products. There are certain restraints covered in the report, such as potential markets predominantly using conventional ingredients, limited consumer awareness, and product positioning inhibiting the growth of the microbial source hydrocolloids market. The expanding applications and rising awareness regarding microbial source hydrocolloids among local producers are expected to create opportunities for the growth of the market. Major trends governing the microbial source hydrocolloids market include manufactures that are focused on increasing business horizons for microbial source hydrocolloids, and increasing adoption of microbial source hydrocolloids owing to the consumption of high dietary fibers. We have also included an outlook for the global food and beverage industry, major trends influencing the food and beverage industry, global trends in the food and beverage sector, an overview of the food additives industry, and perceived health benefits of microbial source hydrocolloids. The report also comprises a strategic overview, followed by the value chain analysis and key information of the prominent players operating in the global microbial source hydrocolloids market, along with a detailed competitive analysis. This information will give a thorough overview of the microbial source hydrocolloids market to the readers. The microbial source hydrocolloids market report also includes a market attractiveness analysis by product type, application, end use, and region/country, along with absolute $ opportunity and incremental $ opportunity. There is a year-on-year growth trend covered in the report for every sub-segment. The report also includes market structure, and a detailed comparison between multinational players and regional players in the microbial source hydrocolloids market. During the study of the microbial source hydrocolloids market, our analysts observed that microbial source hydrocolloids are largely preferred by the manufacturers of food products such as bakery, dairy, confectionery, convenience food, and other such products. Food manufacturers engaged in the manufacturing of food thickening agents, emulsifiers, stabilizers, binders, coating agents, texturizers, and others account for a significant share of the consumption of microbial source hydrocolloids. Microbial source hydrocolloids are used as food stabilizers, binding agents, texturizing agents, gelling agents, coatings, and thickeners. The report states that microbial source hydrocolloids find large-scale application as thickening agents when compared to other applications such as gelling agents, stabilizers, emulsifiers, coating agents, and texturizing agents. This disparity in applications can be attributed to the increasing demand for thickening agents in the bakery and confectionery. The report also consists of the company profiles of prominent microbial source hydrocolloid manufacturers, and the revenue generated by these companies across five regions – Latin America, North America, APAC (Asia Pacific), Europe, and MEA (Middle Eastern and Africa). To evaluate the revenue of microbial source hydrocolloid manufacturers, the average price of microbial source hydrocolloids was obtained from various suppliers, manufacturers, distributors, and exporters through quotes. The key application segments of microbial source hydrocolloids were considered, and the dynamic ones were projected on the basis of feedback from different secondary sources and primary respondents. Data points were collected and considered for the modelling approach, which includes the overview of the bakery industry, overview of confectionery manufacturers, overview of the hydrocolloids industry, outlook of the food and beverage industry, and the average purchase price of microbial source hydrocolloids. Assuming that currency rates remain constant during the forecast period, the microbial source hydrocolloids market value and volume were estimated. The microbial source hydrocolloids market report also includes additional information such as opportunity pockets for the manufacturers of microbial source hydrocolloids, global economic outlook, perceived health benefits of microbial source hydrocolloids, key regulations in various regions, major trends in the food and beverage industry, an outlook of the food additives industry, forecast factors, and recent developments in the microbial source hydrocolloids market. Various secondary and primary sources were consulted during the course of the study. Secondary sources include annual reports of major companies, recent publications, Factiva, and Hoovers. The report also includes a detailed pricing analysis on the basis of product type for every region, and the trade scenario of microbial source hydrocolloids. The trade scenario includes the data of top exporters and importers in the microbial source hydrocolloids market. A comprehensive competition analysis of the major companies in the microbial source hydrocolloids market has also been provided in the report. This will help readers evaluate the long-term and the short-term strategies, various product offerings, and recent developments in the microbial source hydrocolloids marketplace. Some of the key players analyzed in the microbial source hydrocolloids market report are CP Kelco, DowDuPont Inc., Cargill, Inc., Ingredion Inc., Archer Daniels Midland Company, Koninklijke DSM N.V., Ashland Global Holdings Inc., Fuerst Day Lawson Limited, Nestlé Health Science S.A., Jungbunzlauer Holding AG, Deosen USA, Inc., Tate & Lyle PLC, Lubrizol Corporation, Fiberstar, Inc., Euroduna Food Ingredients GmbH, B&V SRL, Hawkins Watts, Compañía Española de Algas Marinas S.A., and Hispanagar, S.A., among the other microbial source hydrocolloid manufacturers. Microbial source hydrocolloids are a type of hydrocolloids derived from microbial sources such bacterial polysaccharides. These can be obtained by fermenting bacterial polysaccharides. Microbial source hydrocolloids are of various types such as xanthan gum, gellan gum, curdlan, dextran, pullulan, and scleroglucan. Microbial source hydrocolloids are water soluble polysaccharides. Microbial source hydrocolloids were initially used as substitutes for gelling agents in order to replace agar in culture media, which is used to grow various microorganisms. Later, the usage of microbial source hydrocolloids expanded to include food products such as food additives. Microbial source hydrocolloids are widely used as emulsifiers, thickeners, and stabilizers. They are also used as substitutes for gelatin in the manufacturing of vegan candies and confectioneries. Microbial source hydrocolloids are also used in plant-based milk products, and are listed as an ingredient in soy milk. Manufacturers of microbial source hydrocolloids are focusing on expanding their business horizons, which will help enhance production capacity in order to meet the increasing demand for microbial source hydrocolloids in various regions. In April 2016, CP Kelco expanded its production capacity of gellan gum and pectin at its production plant in China. In addition, the company established a global innovation center for hydrocolloids in China. In October 2016, CP Kelco expanded its presence in the Middle Eastern market by setting up a new laboratory and office in Dubai, UAE, to enhance it production capabilities so as to serve customers in the Middle East, Africa, and Turkey. There has been an increase in the adoption of microbial source hydrocolloids, owing to the presence of high dietary fiber content, which helps in healthy bowel movement and digestion. Microbial source hydrocolloids can benefit patients suffering from irregular bowel movement and constipation. There has been an increase in the number of manufacturers focusing on securing regulatory clearances for microbial source hydrocolloids. In November 2016, EFSA (European Food Safety Authority) concluded that, gum Arabic can be included in FibreGum, a product from Nexira International, as a dietary fiber for consumers. Developing countries in Latin America and Asia are becoming the target markets for microbial source hydrocolloid manufacturers. This is due to the growing benefits of microbial source hydrocolloids. In December 2016, Cargill opened an innovation center in Shanghai, China. The objective of this expansion was to focus on taste and flavor, food ingredients, etc., as per consumer demand. Microbial source hydrocolloid manufacturers are focusing on regional expansion in order to leverage opportunities and expand their consumer base through strategic agreements, launch of new products, and various partnerships. In September 2016, Kerry Food Ingredients Cebu Inc., a Philippines-based company, was acquired by W Hydrocolloids. It acquired the seaweed processing facility. This acquisition will help meet various consumer requirements. There is increased usage of microbial source hydrocolloids in various ready-to-mix and eat products such as dessert mixes, curries, and bakery products. The gelling, binding, and thickening properties of microbial source hydrocolloids vary according to the ratio of amylose and amylopectin. Various other techniques allow for these ratios to be tweaked according to requirements. Thus, microbial source hydrocolloids find application in convenience food products. Compañía Española de Algas Marinas S.A.